Cold has finally come to central Texas. And by cold I mean 60 degrees. I know that’s nothing, but nevertheless, I’m freezing. Because I had a much more substantial presence this time last year (i.e. 30 lbs additional insulation), none of my cold weather clothes fit. This is good and bad. Good because GO JENNY! GO JENNY! Bad because whoever decides what styles will be “in” this season apparently forgot to take their meds on “fashion” day. I spent the last 2 days trying to find something…anything…that will keep me warm, but not ugly. This something does not exist. We have 2 options this season: Unimaginably bulky cableknits (which I have nothing against then they are of normal size, but this is Costco bulk I’m talking) or those awful cardigan/empire waist/giant button/bell sleeve/weird color things. Sorry, but I cannot support that campaign. Oh and I forgot the 3rd option: Christmas tree sweatshirts. Do you know I saw an appliquéd Christmas moose on a shirt last night? A MOOSE. I would have LOVED to sit in on the board meeting where that idea was approved. I’m pretty sure there was some sort of heavenly chorus happening and I swear the room got a little brighter. 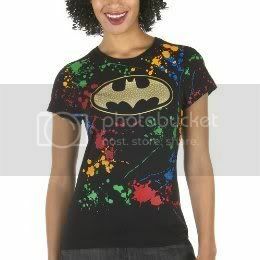 And yes, I am aware that it is a rainbow splatter painted rhinestone studded batman shirt and short sleeved and I’m supposed to be looking for winter stuff. But think about it…if there were ever a rainbow splatter painted rhinestone studded batman personality to walk this earth, you know it’s me. So as I’m holding my soulshirt in my hands and realizing the mother ship has finally called me home, I look at the price tag. *Insert record screech here* $30. For a tshirt. At Target. Oh mass retailer, it is so ON! Consider yourself on notice.